Two architect designed pavilions. Two ways to stay. Ideal for a couple or family. 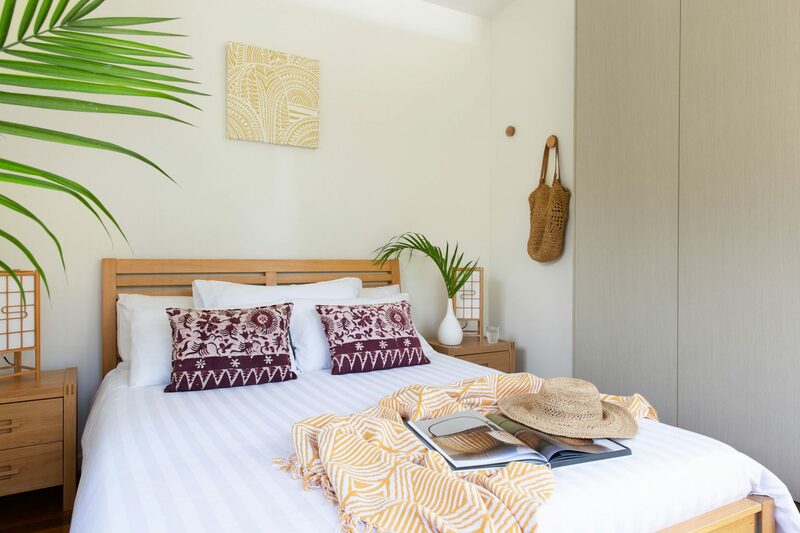 Set amongst extensive tropical gardens on a 50 acre property, The Lily Pad is located just a few minutes from Byron Bay’s vibrant town and iconic beaches. You’ll enjoy the best of both worlds when you stay. It’s private, relaxing and exclusive – and yet so very close to everything! We love it there and know you will too. 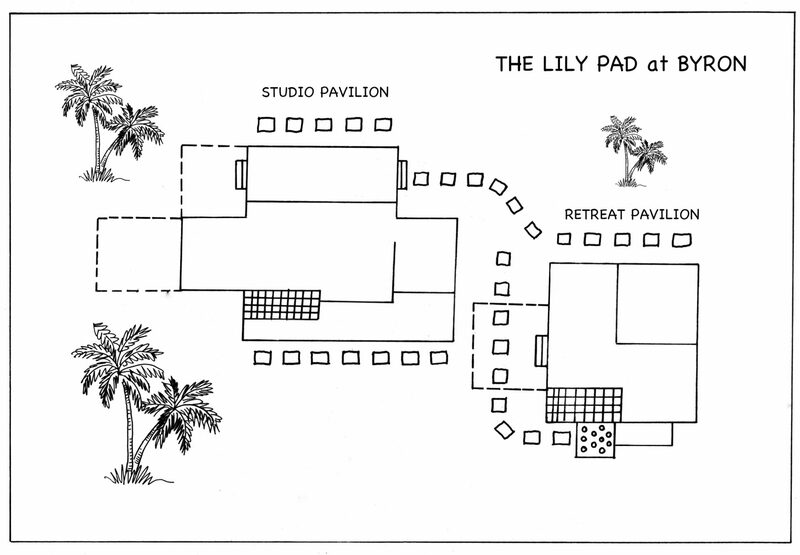 The Lily Pad has two accommodation pavilions, the Studio and the Retreat, which are located right next to each other. While there’s the option to book one or both pavilions, only one set of guests stays at The Lily Pad at any time, so your privacy is assured. A couple may book just the Studio pavilion, while a family can add the Retreat pavilion to provide additional sleeping and living space for two extra people. It’s flexible, versatile and exclusively yours! The Studio pavilion is a relaxing couple’s escape. 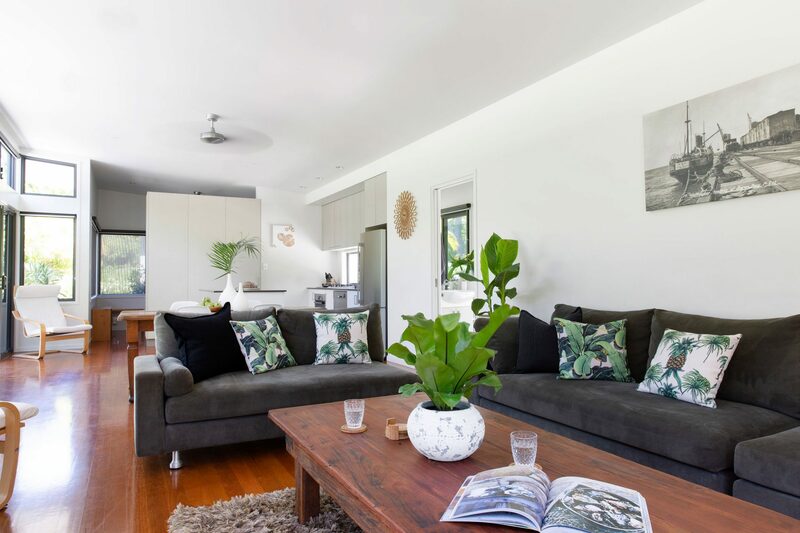 The contemporary interior includes an open plan living/dining room, fully-equipped kitchen, queen bedroom with views to tropical gardens and bathroom with outdoor access. It’s spacious and light-filled with high ceilings, timber floors and sliding glass doors/windows with fly screens. The Retreat pavilion is located right next to the Studio pavilion, providing a separate and private space for two extra guests. It’s perfect for families with teenage children, or other accompanying family or friends, who want to enjoy a holiday together while also preserving space for each other to relax and unwind in privacy. The Studio Pavilion is the focal point for stays at The Lily Pad at Byron. The Retreat Pavilion provides extra sleeping and living space for 2 guests. One couple can be accommodated in the Studio’s queen bedroom. Featuring a full kitchen, dining table and living area with TV, two quality lounges and large rustic coffee table. Featuring a shower and indoor/ outdoor access. A covered weather proof deck overlooks the tropical gardens. Features a quality Weber BBQ, 2 sun lounges and an outdoor dining space. 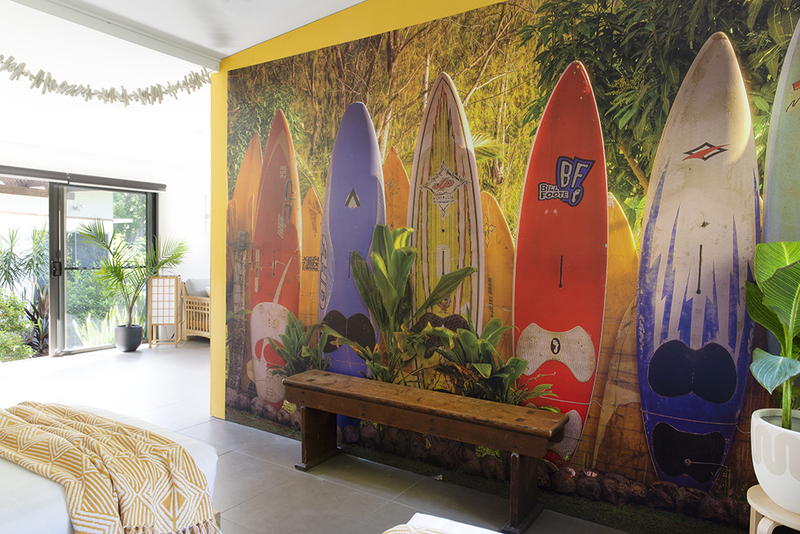 2 king single beds overlook a funky surf mural. The Retreat also features an open plan living space with TV. The Retreat bathroom with shower. Wash off after the beach in this custom designed outdoor shower. Storage area (not for guest use).